In case some of you haven’t heard, last Wednesday (January 4, 2012), SDCC co-founder Richard Alf went to his sweet reward. He was 59 and suffered from pancreatic cancer, which ultimately caused his demise. 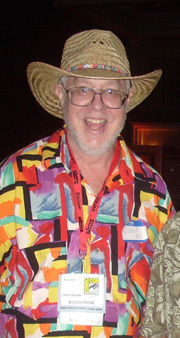 Richard Alf was one of the four people responsible for creating the San Diego Comic Convention back in 1970 (the other three co-founders being Shel Dorf, Ken Krueger, and Mike Towry). Richard’s business acumen and ’54 VW bug were crucial to helping Shel Dorf get Comic-Con going in its early days. “He was a really good businessman … For the first three years, Richard would front the money — and it could have been as much as a few thousand dollars — to the convention and then get paid back afterward,” fellow SDCC co-founder Mike Towry says in a San Diego Union-Tribune article on Richard’s passing. Not to jinx anything, but Mike Towry appears to be last man standing, as it were; both Dorf and Krueger went to the big comic-con in the sky in 2009. On behalf of the board of directors, staff, committee and volunteers of Comic-Con we mourn the loss of our friend Richard Alf, and send our heartfelt sympathy to his loved ones. As one of the original founders of our organization, he was instrumental in creating Comic-Con as an event that sought to highlight the contribution of comics, science fiction, film, literature, and the greater popular arts and bring them to a wider audience. His achievement is even more remarkable when we consider that he was only 17 years old when he and a small group of friends undertook the great adventure that would become Comic-Con. Today is truly a sad day for all of us. What’s interesting is that the Associated Press put out an article about Richard Alf’s passing and almost every small and large mainstream news outlet has picked up the article, from EW.com to Huffington Post to NPR. Yet, to date, NONE of the comics industry sites (such as ComicsAlliance and such) have even mentioned that the world is short one more SDCC founder. Kind of surreal,that.